Cardbomb: Moon Men! Love You to the Moon & Back! Moon Men! Love You to the Moon & Back! Hi! I hope you all are having an amazing day. 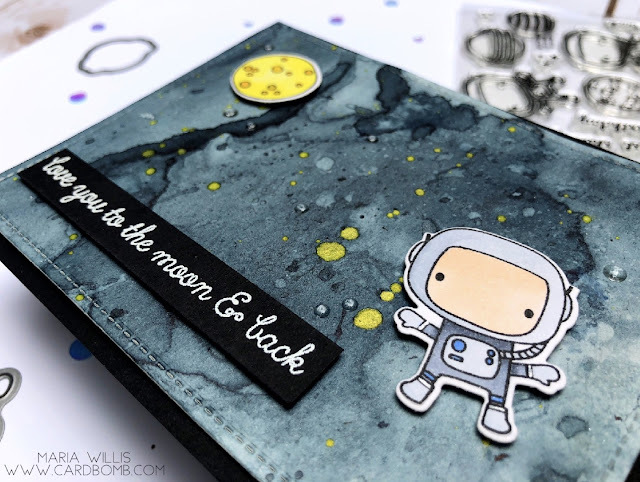 I'm just popping in to share another shimmery, sparkly card that I made with Tonic Nuvo Shimmer Powder and the adorable Moon Men stamp set from Reverse Confetti. I started by making the background using the black Nuvo Shimmer Powder (the color is called Storm Cloud). 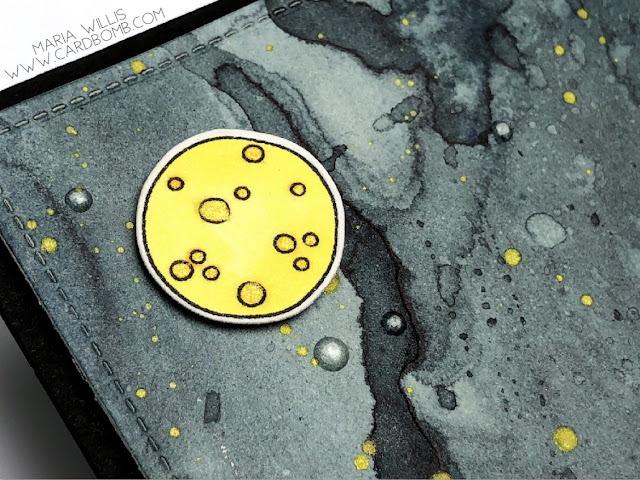 Then I used the yellow/gold powder (Solar Flare) to splatter the background so that it looked like outer space. I also splattered it with clean water and then blotted it with a paper towel so that I had some lighter spots that gave the background a little bit more depth. I cut the background out with a frame from Lawn Fawn so that it would have stitched detail on the edges. 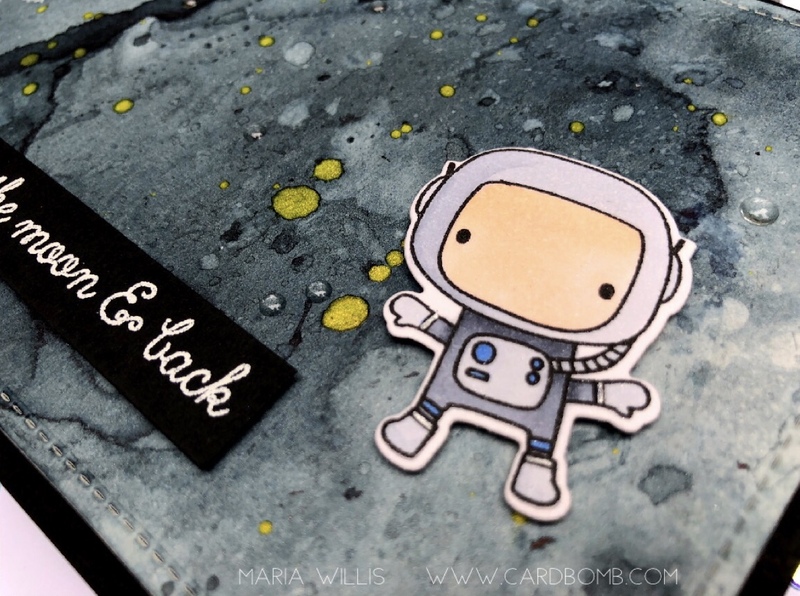 I colored my moon man with my Copic markers and then heat embossed my sentiment in white onto black cardstock. I added both of those to the card front with foam adhesive so that they would pop off of the card. I also colored the moon with Copics and adhered it to the card using foam tape. If you look closely at the moon you can see that the craters sparkle and shine. That's because I blinged them out by watercoloring some Solar Flare shimmer powder onto them. It looks really cool in real life. I also added some clear epoxy embellishments to the background. I think they added to the galaxy look without being too over the top. If you aren't familiar with how to use the Tonic Nuvo Shimmer Powders and want to see some fun ways to use them-check out this video below. Over at the Simon Says Wednesday Challenge this week they've got a Bling It On themed challenge and I'm adding this card to the mix. 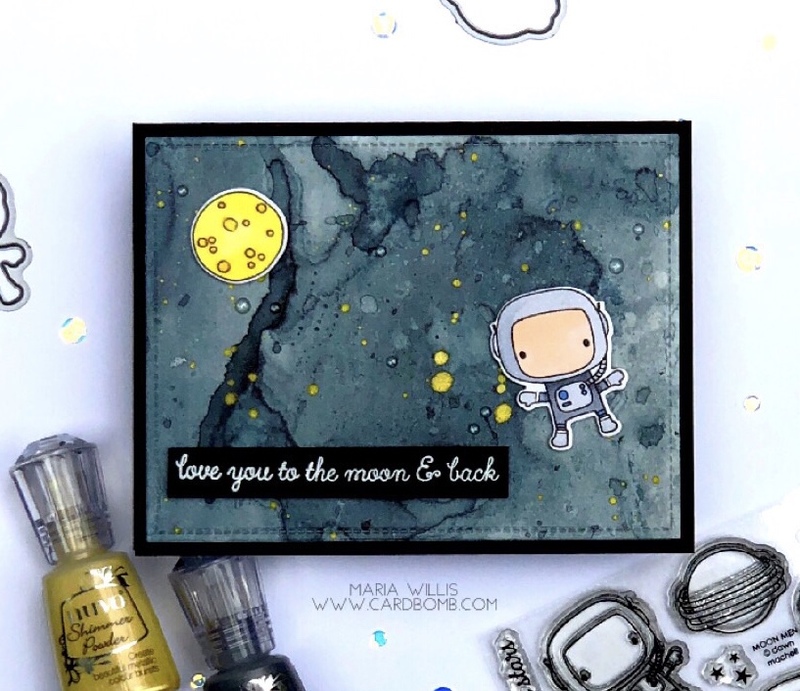 If you want to check out all of the cool inspiration from the Simon Says Stamp design team just click HERE to head over there. 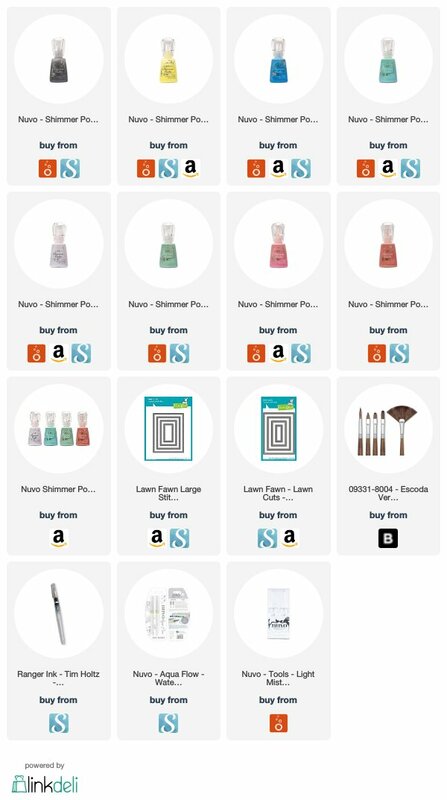 If you're interested in checking out the products that I've used today please feel free to check out the links below. If you decide to do any shopping through the links below I will get a small commission at no extra cost to you (so thanks for shopping with me!). Ok! It's dinner time... so I'd better go make dinner now. Have a great one and I'll be back soon! What a gorgeous card. That background is phenomenal!! I love it. And that astronaut is pretty darn cute too. Thanks for joining us this week for the Bling It On challenge at Simon Says Stamp Wednesday Challenge. Stencils meet Gel Printing-Ooh La La! 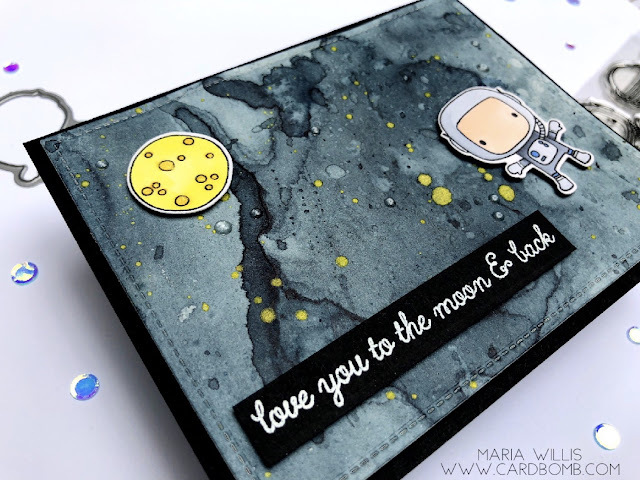 Watercolor fun and a Fancy Envelope!